Kerry Packer was one of those larger than life characters who are one in a million. Some people know him for his keen and ruthless business acumen. Some people remember him for revolutionising modern day cricket. However it is his gargantuan appetite for the punt we are interested in. There are legends of Packer’s gambling binges from winning enough money to almost bankrupt a casino and cause their share price to instantly drop, to losing enough money to shadow the national budget of four South American countries. My interest in the mythology of Kerry Packer began on a trip down to Melbourne five years ago, where I caught up with an old dealing buddy of mine. He began to tell me an unconfirmed rumour about his boss, Mr. Packer. The rumour stems from Packer’s kidney transplant (donated by his helicopter pilot) in 2000. Apparently a single, lowly croupier from Crown sent him a “Get Well” card and note, allegedly the only Crown casino employee to do so. Once Kerry had recovered from the transplant, the rumour goes he promoted the dealer to pit boss with an obscene raise as thanks for the dealer’s considerate gesture. Even more grandiose than this rumoured gesture are some of Packer’s antics while in the grip of a fevered punting session. So we will have a look at some of Packer’s greatest gambling stories. A story that gets every dealer and waitress a little excited are the stories of Packer’s obscenely generous tips. Packer was so impressed by one cocktail waitress he asked her if she had a mortgage. She said she did, so he asked her to bring it in the next day, which she did. The mortgage was for $150,000 and Packer paid it off for her immediately. Another time Packer accidentally crashed into a cocktail waitress, sending her tray of drinks flying left, right and centre. To apologise Packer paid off her mortgage of $130,000. One dealer was offered an $80,000 tip by Packer but respectfully declined, informing him dealers are not allowed to accept gratuities. Packer apparently called over the Pit Boss immediately and demanded the dealer be sacked on the spot. The Pit Boss fired her. Packer then pushed forward the $80,000 worth of chips before demanding the Pit Boss re-hire her. 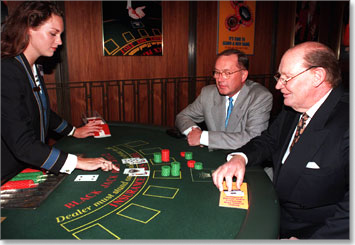 In 1995 the legend goes Packer went berserk at the MGM Grand tables, hitting an inconceivable lucky streak, playing blackjack and baccarat for as much as $500,000 per hand and taking the casino for as much as $26 million in only a couple of hours. Once Kerry had made the win, he packed up shop and left. For taking such a hit to their bottom line Packer found himself banned from the MGM Grand and its affiliated hotels and casinos for life. They say Kerry was playing every box at a blackjack table and not allowing anyone else to play or back bet at the table. They say this angered an arrogant Texan oil baron. The Texan began to throw his weight around, complaining and telling all and sundry he was a big deal. He’s worth $100 million. He shouldn’t have to wait for a goddang blackjack table! After being challenged to gamble his entire fortune on the toss of a coin, the Texan quietened down and slunk away into the shadows as Kerry continued on at his table, unfazed. Legend has it no single bookie in NSW had the necessary war chest to take the wild bets of sheer volume Packer was constantly itching to place at the racing carnivals. In the end a gang of bookies banded together to pool their resources in an effort to take on Packer. Packer’s biggest splurge at the races came in 1987 on Golden Slipper Day when it is said that he single-handedly more than quadrupled the on-course book-markers average haul for the day. While Packer liked to play casino games overseas he was a constant with many major bookmakers, including a huge rivalry with former leading SP bookie Alan Tripp. Packer’s son, James, is now in business with Tripp’s son with Crownbet now one of Australia’s leading corporate bookies. These are just a few of the most well known legends of Packer’s punting, that happened before his death in 2005. He left behind a huge legacy of keen business dealings and having won and lost fortunes on the horses, blackjack and baccarat.